Palo Alto, CA – December 18, 2017 — Science Exchange, the world’s leading and most secure enterprise platform for outsourced research and development (R&D), today announced a strategic partnership with Breakout Labs, a fund within the Thiel Foundation that backs scientist-entrepreneurs working at the intersections of technology, biology, materials, and energy. The newly formed partnership allows for Breakout Labs to provide its portfolio companies’ scientists with on-demand access to a global network of research suppliers via the Science Exchange-powered private marketplace. The private marketplace enables instant access to thousands of research tools, technologies, and services from over 2,500+ commercial CROs, academic labs, and government facilities under a single Science Exchange contract. Additionally, the platform users receive end-to-end PhD-level support from the Science Exchange staff scientists in identifying the best external innovations to expedite their R&D cycles. 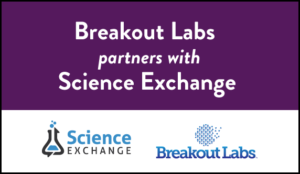 Breakout Labs is the latest R&D organization to choose to partner with Science Exchange and join more than 30 enterprise clients and Life Science incubators that are effectively managing their outsourced R&D with Science Exchange-powered marketplaces. Breakout Labs is a revolving fund within the Thiel Foundation that supports early stage companies as they transition radical scientific advances out of the research lab and into the economy. The program backs bold scientists who work at the intersections of technology, biology, materials, and energy. More than capital, Breakout Labs provides additional support through a two-year program that includes introductions to follow-on funders, corporate partners and other resources to drive commercialization. To learn more, visit: www.breakoutlabs.org. Gursatya Singh, also known as "Guru", manages the development and execution of strategic marketing initiatives to improve platform providers’ visibility and user experience. He is a true guru when it comes to helping providers better advertise their research services and providing buyers with easy access to recently commercialized external innovations. Whether working as a lab researcher, publishing scientific papers, or helping start life science startups, Guru believes in making the scientific world more collaborative and connected. Guru holds a master’s degree in biotechnology from the University of Delaware. Follow him on Twitter @Gursatya.